Palladium has been the best performer among precious metals for some time now. Since the beginning of 2016, palladium is up 65%, easily beating the price increases seen in platinum, gold and silver. What factors made palladium outperform its peers and what should palladium buyers pay attention to this year? Chinese car sales for the first two months of 2017 beat expectations and were 8.8% higher compared to the same period in 2016. According to a Market Watch report, the pace is still weaker than the 14% increase reported last year by the industry as tax incentives urged customers to buy cars. In Q4 of 2016, China announced a 50% cut in its sales tax from 10% to 5% for small automobiles. The tax cut was effective until the end of 2016. Most analysts were expecting a big slowdown in the largest automobile market this year, but China continues to surprise markets. The country agreed to extend the cut, although at a higher rate of 7.5%. In 2018 it will revert to 10%. Therefore, while auto sales might not beat the high levels reached last year, Chinese citizens will still likely take advantage of a lower tax in 2017. Overall, auto markets were really strong in 2016, contributing to a 50% rise in palladium prices last year. This market might surprise again in 2017 but signs of a plateau in the U.S. and uncertainties in China due to an extended but higher tax cut are factors to watch this year. South African Rand Index. Source:MetalMiner analysis of @stockcharts.com data. Automotive MMI Drops 4.3%, What’s Going On With Steel? Automakers sold 1.33 million vehicles in the U.S. in February, down 1.1% from the same month a year ago, as consumers continued to shift away from buying cars in favor of trucks and SUVs. Our Automotive MMI fell 4.3% as well, due in part to a pull back this month in steel prices, particularly the hot-dipped galvanized variety. There’s been plenty of analysis on our site about whether the steel price fall is merely a pause in an overall up trend or a sign of deeper issues in the individual North American product markets. If major automotive products such as cold-rolled coil and HDG are, indeed, being squeezed then prices could increase quickly in the coming months as mills take advantage of short supply, even if more capacity comes online later in the year. The other products that make up the index are still firmly in bull market territory with copper leading the way. The other major automotive consumer market that creates supplier demand is China’s, the world’s largest automotive market. It saw auto sales decline by 1.1% year-on-year in January to 2.2 million units. Total vehicle sales, including trucks and buses, however, came in 0.2% higher year-on-year to 2.5 million units. Some of these numbers could be affected by the Lunar New Year holiday. China is also entering the planned final year of a major government automotive purchase rebate which could affect sales as the incentive winds down. U.S. Hot-dipped galvanized steel fell 1.5% from $841 a short ton in February to $828/st this month. U.S. Platinum bars increased 2.92% from $993 an ounce in February to $1,022 an ounce this month. Primary three-month LME copper increased .08% from $5,930 per metric ton in February to $5.935/mt this month. 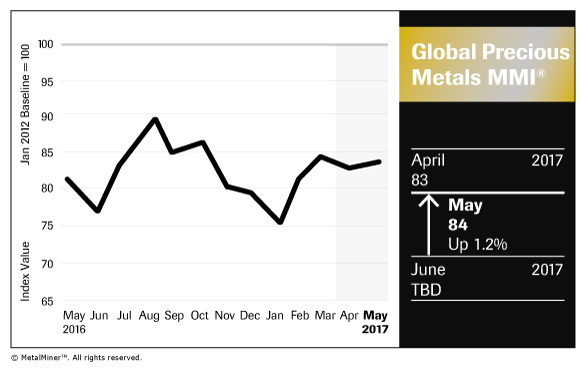 MetalMiner’s index of global precious metals prices dropped yet again this month, falling 3.8% for a January 2017 reading of 76, down from 79 in December. The U.S. palladium price got a bit too frothy last month, resulting in a December MMI reading of $768 — which was good enough for an 18-month high. However, for the January MMI reading, that price experienced a pullback, dipping back down under $700 per ounce (although not quite reaching November’s levels). So a correction in that price point’s journey is evident. The U.S. platinum bar price also had a slight drop-off, as did silver and gold prices across global markets tracked by the MetalMiner IndX. But a few of those had a lot to do with what’s happening across precious metals markets right now — especially gold. What’s causing gold prices to fall dramatically? The U.S. dollar. Gold (in dark) vs the dollar index (in green). Source: MetalMiner analysis of @stockcharts.com. Markets expected the Federal Reserve to raise rates by the end of the year. In December the Fed raised interest rates by a quarter point, as expected, but policymakers signaled a likelihood of three increases in 2017, up from prior expectations for two moves. While interest rates outside the U.S. stay near zero or even in negative territory, it’s no wonder yield-seeking investors are going after the greenback. The ongoing political tensions in Europe are causing the dollar to appreciate against the euro. The ongoing refugee crisis in Europe, Brexit, terrorist attacks and political instability are some of the events causing investors to lose their appetite for the European currency this year. Finally, the victory of Donald Trump has added fuel to the dollar’s bull market. The new president-elect has proposed new tax policies that will potentially make multinational companies bring their foreign profits back to U.S., increasing the demand for dollars. In addition, the dollar is perceived as a stronger currency since investors expect growth in US to get a boost. Essentially, what we wrote last month is still holding true, and it’s hard to see a reversal in the near term. 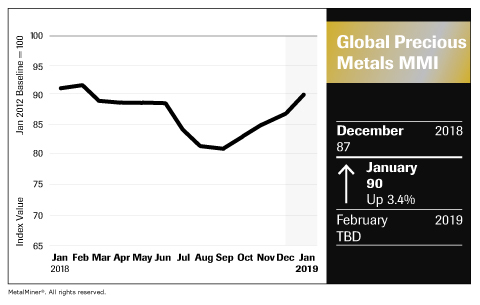 And this month’s Global Precious Metals MMI was no exception – after hitting yet another all-time low of 68 last month, the sub-index bounced back up to 70 for our January reading. And even the Copper MMI had a tiny one too, (stay tuned for that story, coming next week). So, alongside the baby-sized Fed interest rate hike came a bit of a bounce for our precious metals price index. Welcome to the party. Putting aside gold and silver for now (global prices for which, on balance, fell for silver but rose for gold on the MetalMiner IndX), let’s focus again on the more industrial of the precious – the two PGMs we track. As far as bigger end-use drivers go, the automotive markets have made most of the headlines lately. In China, car sales rose to the highest level ever, increasing in December by more than 23% from November 2014. That is the second consecutive month in which China’s passenger car sales grew by double digits. Here in the US, data from Ward’s Automotive Group shows 1.63 million vehicles were sold in December last year, making this the strongest month of 2015. In all of 2015, sales totaled 17.38 million, which exceeds the previous record high from 2000. Producers like Johnson Matthey may have reason to look forward to 2016. Get the exact prices by logging in or signing up for MetalMiner membership below! US auto sales remain the bright spot in the drivers of the monthly Automotive MMI®. Seasonally adjusted annual rate of sales for light vehicles rose to 17.8 million compared with 17.3 million a year earlier and was the highest since July 2005, according to researcher Autodata Corp. August was the fourth consecutive month that adjusted sales remained above the 17 million mark. The Automotive MMI® still registered only a value of 73 in September, a decrease of 3.9% from 76 in August. Weak prices for most of the base metals that make up the index (HDG, copper, aluminum and lead) abound despite strong end user sales in the US. In China, auto sales are falling with the rest of the domestic economy there. Chinese auto sales fell by 7.10% in July 2015 compared to July 2014, the largest fall since February 2013 and such a large economy’s fall is dragging down the prices of automotive metals just as it is dragging down the prices of oil and other commodities. Major iron ore producers, Rio Tinto PLC, BHP Billiton, Vale SA and Fortescue Metals Group Limited have ramped up production again despite massive iron ore and steel oversupply. Zacks.com believes they intend to continue exploring for iron ore in Australia despite lower growth forecasts from China and weaker iron ore prices, betting on continued strength in iron ore demand over the long term. This is normal behavior from major miners such as the Big Three (Rio, BHP and Vale) and almost-there cousin Fortescue. They can make a profit by squeezing volume out of their mines at low prices based on scale, alone, but iron ore investment is coming from non-traditional miners, as well. India’s Essar Steel is making a $1.9 billion investment in the steelmaking ingredient in Minnesota, of all places. It’s difficult to imagine how such an investment makes long-term sense for Essar without a turnaround in both iron ore and steel prices. Since high-strength automotive steel alloys are one of the best-performing steel products on today’s market, it’s even more difficult to imagine those prices turning around without continued strong auto sales in the US and Europe and a turnaround in China and other emerging markets. For exact pricing, join or log in below!